Hey, Australian students, are you searching for a great site to help you out with your assignments? It’s important to find a place that’s definitely not a scam, one that’s reliable, with good customer support, excellent quality, and low costs. We’re going to have a look at another site today and ask that all-important question: is professionalessaywriters.com legit, and should you ask them for help? ProfessionalEssayWriters’ services are for college-level students and up to doctorate level. You can have essays written for you, or multiple-choice questions answered, books or movies reviewed, even case studies carried out, or an autobiography written for you. They cater for a wide array of studies and disciplines, including art, history, literature, science and technology, all the way to tourism. We looked over their Terms and Conditions to check their refund policy and could see that they offer free unlimited revisions and also will provide a partial refund for delays which are their fault. We checked for testimonials on ProfessionalEssayWriters.com, first of all, and saw that the site doesn’t appear to have any reviews from customers. Then we had a look at the sample provided on the site. While this appeared to be mostly okay, there were a number of typos and punctuation errors. If we received a paper in this condition, we would not have been satisfied, as we would’ve had to edit it before turning it in. Also, we checked Google for any external reviews or customer comments and noted that the reviews which came up gave the site a merely average rating. We priced up a quote for a 10-page essay. 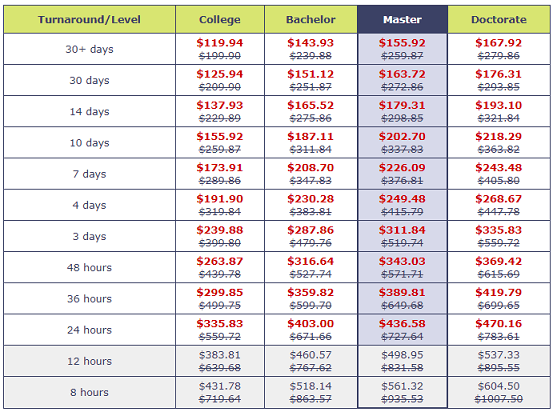 For a student studying for a Master’s degree, with a deadline of 3 days, this would be a staggering $415.79 (USD). They don’t appear to provide quotes in AU dollars. However, we saw several references to discount codes and coupons for as much as 41% off while we were on the site, taking the cost down to $249.48. This is still a large sum of money to pay for an essay, more expensive than other sites we’ve seen. Professional Essay Writers provide a Live Chat service as well as a support email address and phone number (which is US-based). They are available 24/7 for customer support, which means they will be available for Australia despite being mainly targeted toward the US. There was no indication of where they are registered as a company or what country they have their headquarters in. We’d suggest looking for an alternative site to this one. There are many other sites where the prices are lower, the customer support a bit more specifically geared toward Australian students, and the reviews are solidly positive.